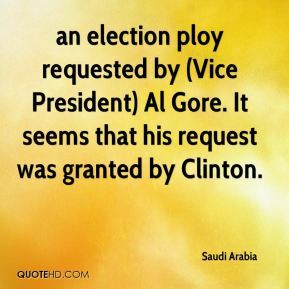 an election ploy requested by (Vice President) Al Gore. It seems that his request was granted by Clinton. 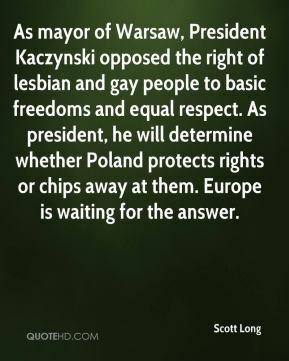 As mayor of Warsaw, President Kaczynski opposed the right of lesbian and gay people to basic freedoms and equal respect. As president, he will determine whether Poland protects rights or chips away at them. Europe is waiting for the answer. This nightmare has gone on long enough. 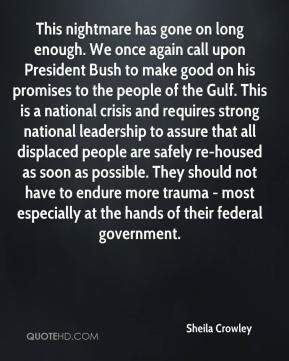 We once again call upon President Bush to make good on his promises to the people of the Gulf. This is a national crisis and requires strong national leadership to assure that all displaced people are safely re-housed as soon as possible. They should not have to endure more trauma - most especially at the hands of their federal government. 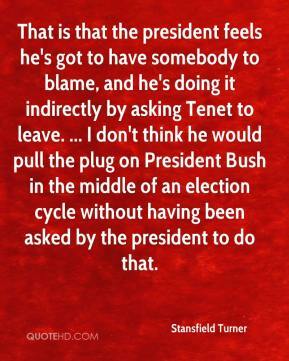 One of the problems with President Bush issuing that kind of ultimatum is that he has no credibility. Members of his administration have said inspections don't matter. 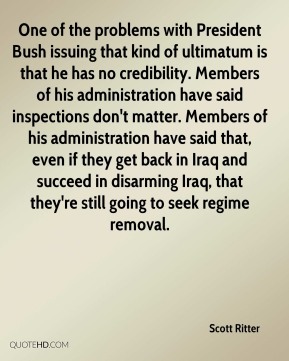 Members of his administration have said that, even if they get back in Iraq and succeed in disarming Iraq, that they're still going to seek regime removal. 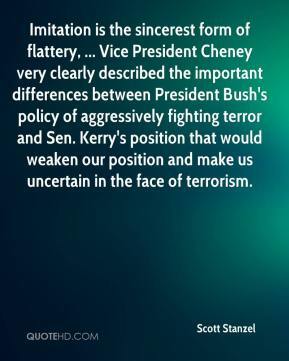 Imitation is the sincerest form of flattery, ... Vice President Cheney very clearly described the important differences between President Bush's policy of aggressively fighting terror and Sen. Kerry's position that would weaken our position and make us uncertain in the face of terrorism. 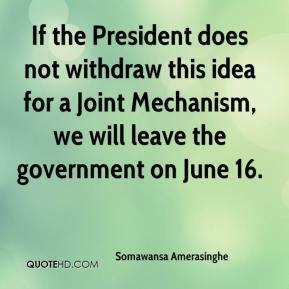 If the President does not withdraw this idea for a Joint Mechanism, we will leave the government on June 16. 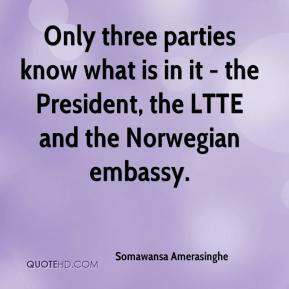 Only three parties know what is in it - the President, the LTTE and the Norwegian embassy. 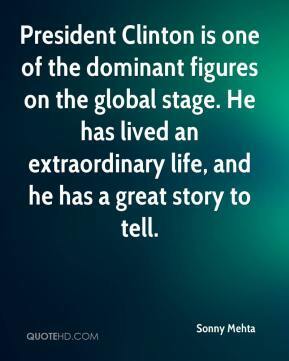 President Clinton is one of the dominant figures on the global stage. He has lived an extraordinary life, and he has a great story to tell. What was he thinking? 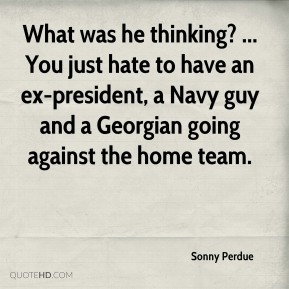 ... You just hate to have an ex-president, a Navy guy and a Georgian going against the home team. President Chen's latest policy initiative will only increase cross-Strait tensions. 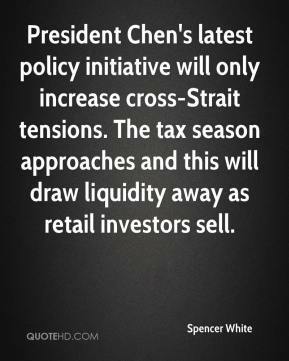 The tax season approaches and this will draw liquidity away as retail investors sell. 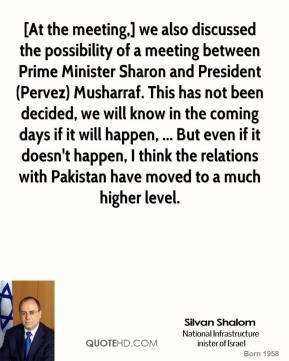 [At the meeting,] we also discussed the possibility of a meeting between Prime Minister Sharon and President (Pervez) Musharraf. 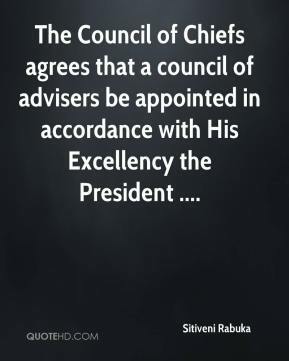 This has not been decided, we will know in the coming days if it will happen, ... But even if it doesn't happen, I think the relations with Pakistan have moved to a much higher level. The Egyptian president is expected to arrive. 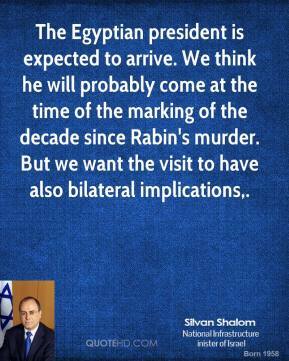 We think he will probably come at the time of the marking of the decade since Rabin's murder. But we want the visit to have also bilateral implications. 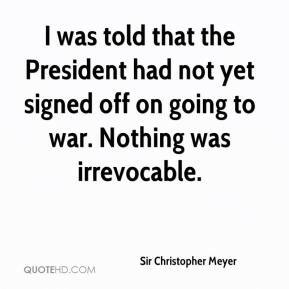 I was told that the President had not yet signed off on going to war. Nothing was irrevocable. 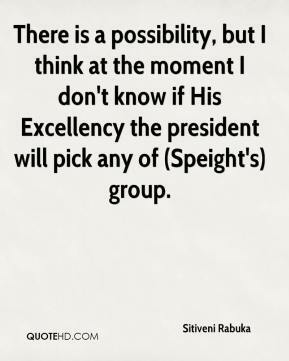 There is a possibility, but I think at the moment I don't know if His Excellency the president will pick any of (Speight's) group. 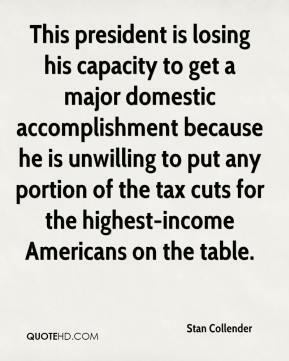 The consciousness of people whose natural bent is to support the president and the military and the status quo is shifting. 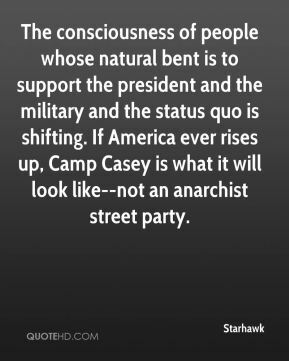 If America ever rises up, Camp Casey is what it will look like--not an anarchist street party. 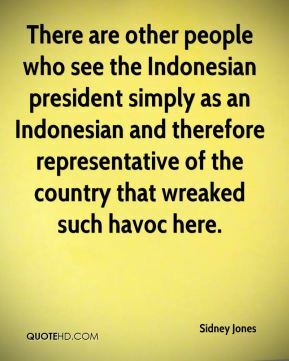 There are other people who see the Indonesian president simply as an Indonesian and therefore representative of the country that wreaked such havoc here. I dislike Condoleezza Rice more than [President] Bush. The thing about it is that she's gotten a free ride from black people. I wish to particularly thank President Musharraf for his courage in promoting peace and moderation in our region and in general. 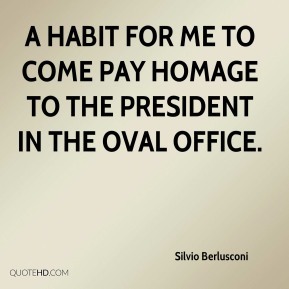 a habit for me to come pay homage to the president in the Oval Office. 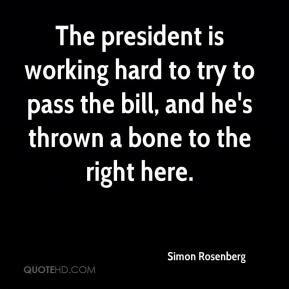 The president is working hard to try to pass the bill, and he's thrown a bone to the right here. 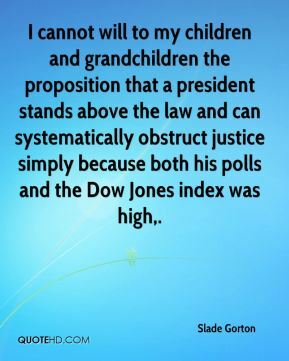 I cannot will to my children and grandchildren the proposition that a president stands above the law and can systematically obstruct justice simply because both his polls and the Dow Jones index was high. 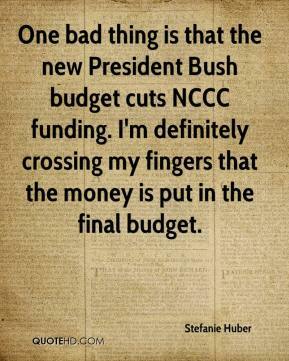 One bad thing is that the new President Bush budget cuts NCCC funding. I'm definitely crossing my fingers that the money is put in the final budget.